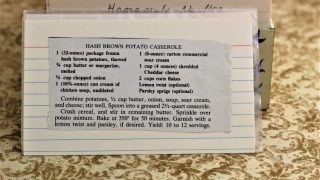 Front of the recipe card for Hash Brown Casserole. 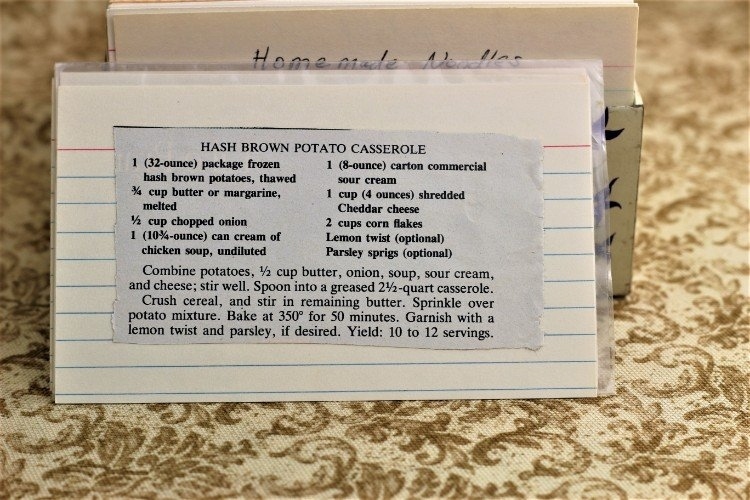 There are lots of fun recipes to read in the box this recipe for Hash Brown Casserole was with. Click here to view all of Vintage Recipe Box 36 recipes. Use the links below to view other recipes similar to this Hash Brown Casserole recipe. If you make this Hash Brown Casserole recipe, please share your photos and comments below! Combine potatoes, ½ cup butter, onion, soup, sour cream, and cheese; stir well. Spoon into a greased 2½-quart casserole. Crush cereal, and stir in remaining butter. Bake at 350° for 50 minutes. Garnish with a lemon twist and parsley, if desired.